Mobile application for a customer of private security company. It's free of charge. Cloud services work at fully in a bundle with control panels Nord GSM, Air and Mini and the monitoring station software Security Center. With other equipment and software MyAlarm functionality will be limited. Settings: push-notifications, sign in by pin code or fingerprint (Touch ID). Remote arming / disarming from app. Smoke, water and gas leak sensors. Balance of personal account and informing about debt (soon). All sites in one app. Security at the level of banking app. We refused to authorize by login and password. Unfortunately, using by all staff «admin / 123456» is not possible any more. 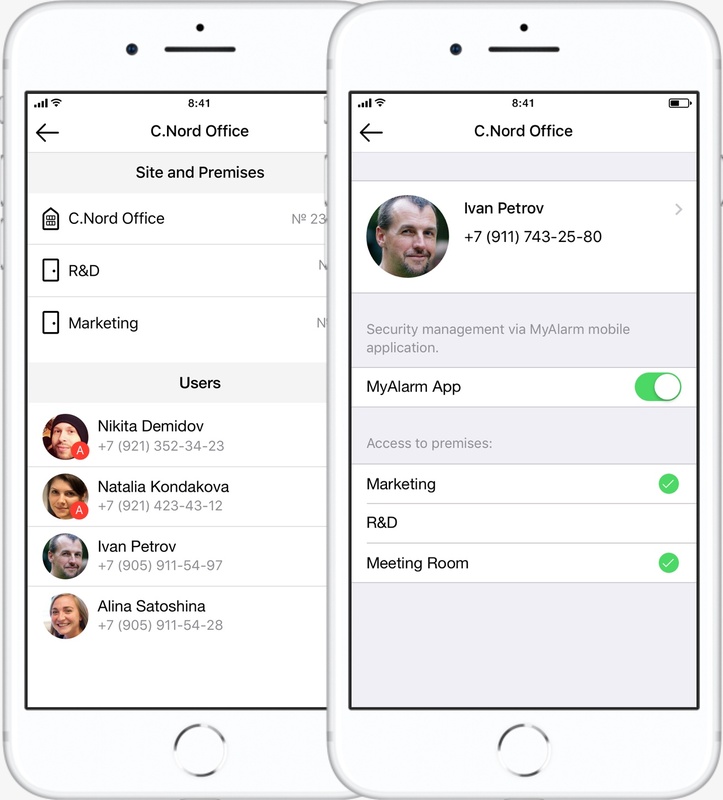 In MyAlarm each user has personal account linked to the personal phone number. When login you must enter the phone number and the code from SMS. Every time you open an application you don't need to enter phone number and wait for SMS — the application remembers you. 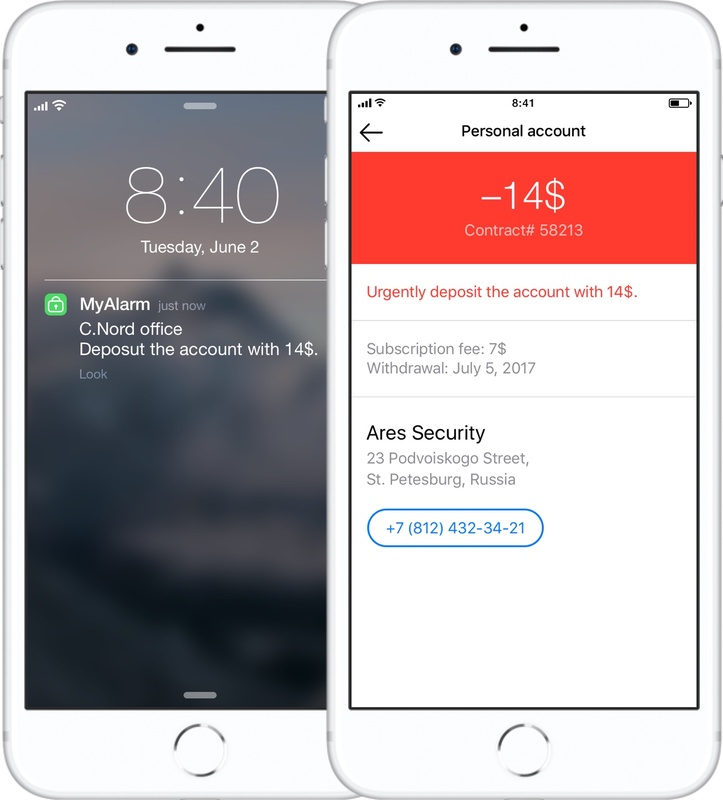 If you don't have pincode on the phone, put the pin to the MyAlarm app by all means. If the phone has a fingerprint scanner (Touch ID), you can enter the application attaching a finger to the scanner. In the site settings Security Center operator invites one or more clients as a site administrator in mobile app. Administrators change the name of sites, partitions ... and invite other users. Users who can manage the site is initially configured in the control panel settings (user number, available partitions, arming / disarming code) and are displayed in app, but these users have no accounts yet. An administrator opens user page in MyAlarm and invites him / her. The user receives SMS with the instruction: where to download MyAlarm and what to do next. in the form of icons. By icons you can determine the current status of partition: armed or disarmed. Each user has a code. He/She can arm or disarm any available partition remotely through mobile app. In case of alarm the partition icon will have a red bell. 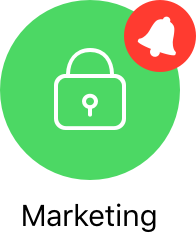 A user will get a push-notification and in the event timeline there will be the corresponding event. 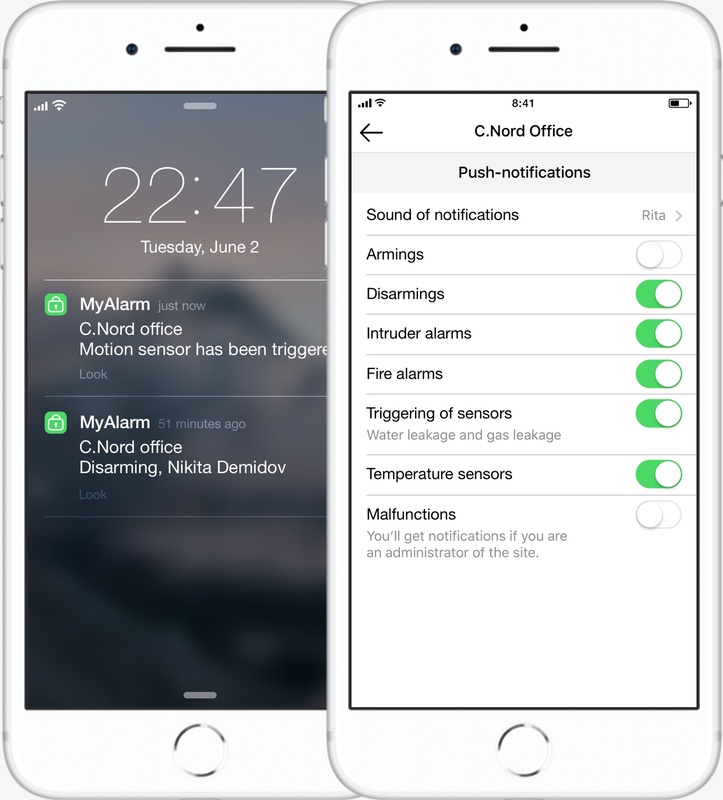 MyAlarm sends push-notifications about the most important events: alarm, armings / disarmings, malfunction and others. For each site you can choose what notifications you want to receive, and what you don't receive. 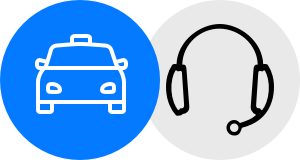 Rita (speech notifier) is a voice assistant, like Siri in Apple products or Alice in Yandex products. notifications. If you select Rita, you hear the notification content by Rita's voice without getting phone from the pocket when you receives a push-notification. Operator of Security Center sets which events should be into the client's timeline for each site. Armings and disarmings with user photo, name and surname. Lack of 110 / 220 V, malfunction of battery, zone break and other security system errors. 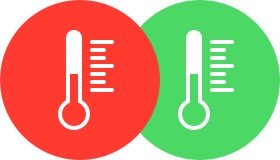 Notifications of temperature exceeding or lowering at the site according with threshold values. Security alarms and alarms from smoke detectors, water leak and gas leak sensors. Actions of operator and rapid response groups while alarm processing. Pressing panic button: virtual in app and stationary at site. An operator of Security Center issues a permit to use panic button in MyAlarm. Thus, a user of app sees the panic button in MyAlarm. You don't need to be present at the site to press the panic button. 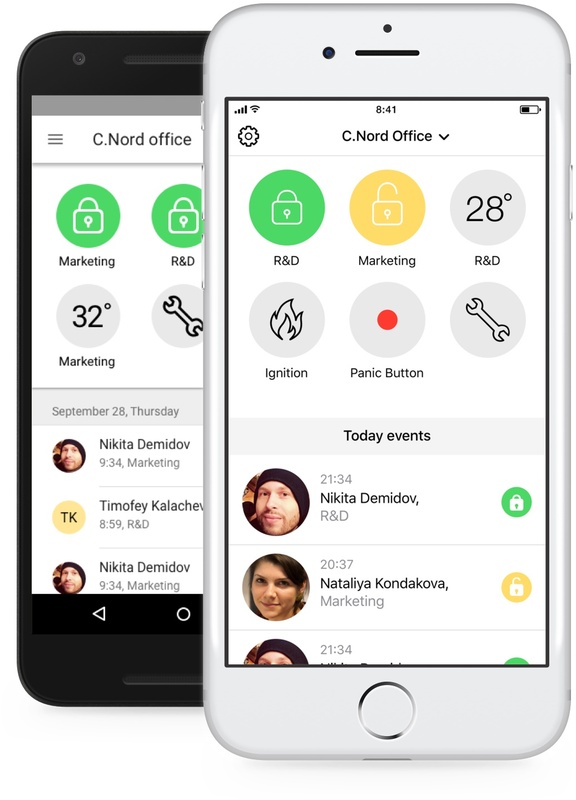 The panic button is in MyAlarm app. 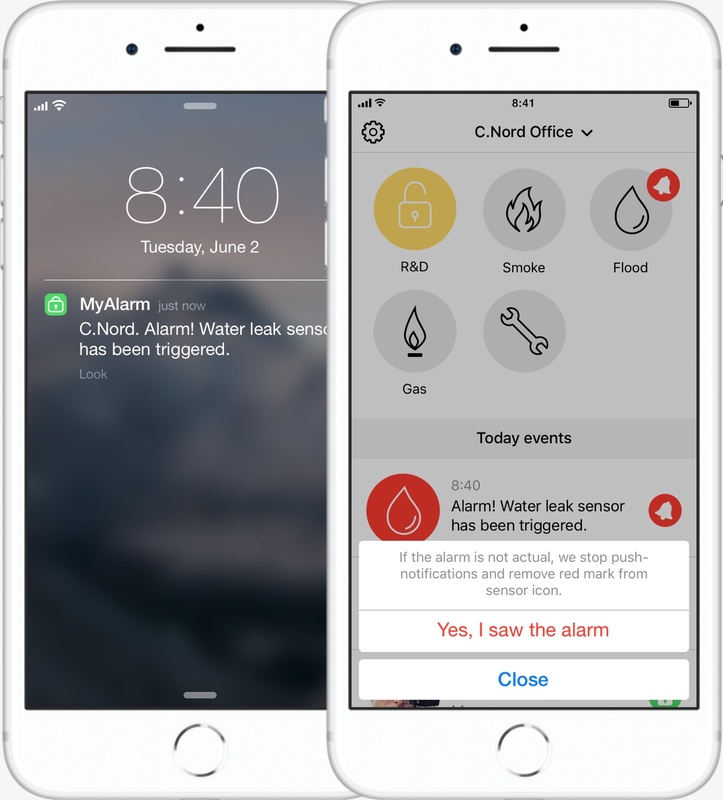 If smoke detectors, water leak or gas leak sensors are installed at the site, they will be displayed in MyAlarm app. If something happens, you will get a push-notification. Several sensors can be hidden under each icon. For example, fire alarm system includes at least two sensors. MyAlarm displays the values of temperature sensors directly on the screen of your mobile phone. You can connect up to 4 sensors per one control panel and give them a clear name in the mobile application. an alarm event will appear in the event timeline. 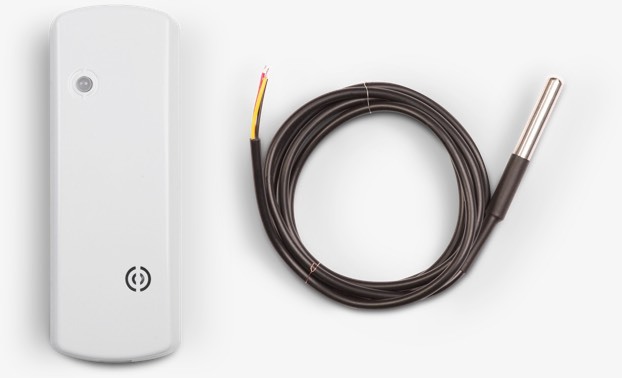 Wireless temperature sensor CN-Celsius and remote wired sensor. If the Security Center software has a connection with the accounting soft of a security company, the company can remind customers via mobile app about the the balance and inform about debt. Client payed security services on time. There are insufficient funds for withdrawal of subscription fee. Withdrawal of subscription fee is coming soon. The site is disconnected from security services for non-payment. You can make flexible informing settings for customers with special terms of security services and payment options. Or you can disable informing at all.